This salvia seemed to enter the world market via Ken Gillanders of Tasmania. People not familiar with Australia sometimes give another explanation. He came across it in Ecuador. 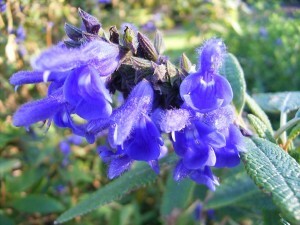 It is a very attractive shrub to 2m with crinkled deep green foliage that has a brown underside and inky blue flowers. We are not real sure what this plant prefers to flower the best but it seems to favour winter for flowering and will also flower in some shade as well as sun. A general shortening of branches around xmas might be a good way to prune. It will layer if on the ground or cuttings will grow easily enough. There is no salvia which resembles corrugata in any way to my knowledge.